Miniature, white, single flowers, marked with pink, with yellow anthers and creamy filaments. Upright, dense, medium growth. Flowers in winter, usually between December and February. Miniature, white, single flowers, marked with pink, with yellow anthers and creamy filaments. Upright, dense, medium growth. Early season flowering. 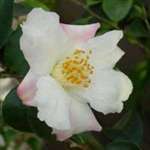 3 camellias arrived (Camellia sasanqua Hugh Evans, Camellia hybrid Spring Mist and Camellia hybrid Yoimachi) in perfect condition. I was over the moon when I opened the parcel, I couldn't believe Hugh Evans even arrived with an intact open flower!! The quality of the plants is exceptional. I think I might develop a bit of an addiction. Thank you so much for putting a big smile on my face.